At least his wife wouldn't have found out about this until over a year and a half after this was recorded. When was the last game transmitted on a Sunday? Corie runs through how he'd like to help his family, particularly his mum. The banker says he's been on the phone to Corie's wife and she's furious he turned down the £12.5k. Banker is up to his usual tricks again. No way I believe him that he's been on the phone to her. Corie reveals he came with a figure in mind which was £10k. The Banker is going to love it now seeing as he has revealed his target. Susan's game in October 2014. And Corie just revealed his target is £10,000. 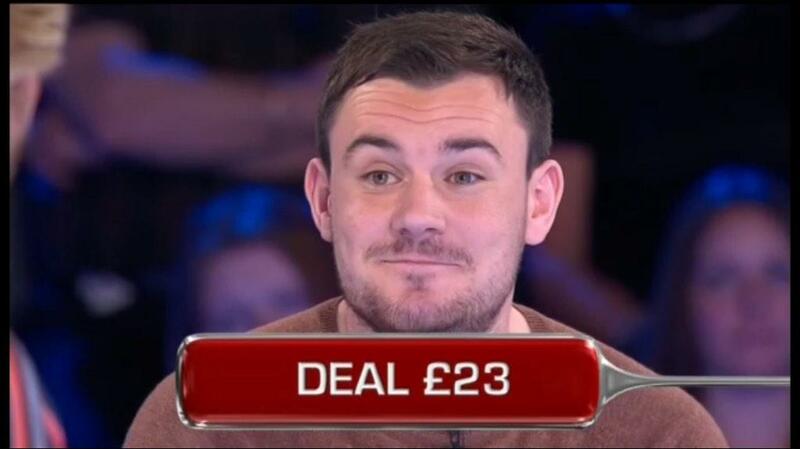 The banker comments on how the offers have been over Corie's target twice now. The final ever QTT in the studio coming up. Perfectly pitched offer for the board, that. I'd go another round, though. Over half of the other players put their 'deal lights' on. Gilly says it's such a good board. Chantelle says he could do so much with the money and it's his if he takes it. Silvana reminds Corie that he's asked her to encourage him to go on.